How good are the notes you take when meeting with others? Are you guilty of merely thinking you’ll remember, and as such, you don’t take the time to record what you discussed, the next steps decided on, etc? I’m sure you’re guilty, because let’s be real, 95% of all salespeople and leaders are too quickly moving on to the next task to take the time to recap a meeting. James Comey has taught all of us something about the value of taking notes. If you don’t know who James Comey is, you’re not a leader. You’re a hermit living in a very small bubble. James Comey in the last couple of months has taught all of us the value of taking notes to recap what was discussed. The result of him taking notes is he’s viewed as the one who has the best answers to what was discussed. Think about the position James Comey would be in if he had not been so well known for taking notes after every meeting. Now think about your position as a sales leader and how much more respected you’d be if you were the one known for the notes you took. I can’t begin to remember all of the meetings I was in as an Account Manager where we had to piece together what had already been decided on. If taking notes is a an activity embraced by a person who was FBI Director for years, don’t you think taking notes would be a habit you should embrace? If we can’t take notes during our meetings, then how can we ever expect our salespeople and those we lead to take them? I don’t have proof, but my sense is the culture in the FBI is everyone takes notes on every meeting for one simple reason — they saw their leader taking them. Culture and habits start at the top! 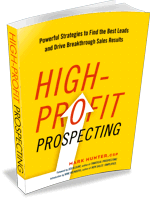 PrevPreviousDoes Your Prospecting Plan Need Fixing?